Episode 70 – John Cristion Dan Sterenchuk and Tommy Estlund are honored to have as our guest, John Cristion. John grew up in and around Philadelphia, but has lived in the Baltimore area for the past 32 years. He is married to Connie (35 years), has three daughters, Heather (36), Ashley (32), and Michelle (30), and one son, Jordan (11). 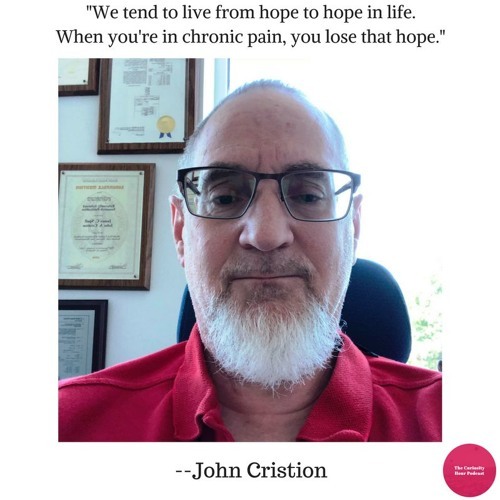 John received a BS in Electrical Engineering at Drexel University in 1986 and a MS in Electrical Engineering at the Johns Hopkins University in 1992. He has been with the Johns Hopkins University Applied Physics Laboratory since 1986 as a Signal Processing Engineer, working on many projects including underwater acoustics, SAR radar, biomedical applications, and chemical & biological sensors. He currently holds five patents and three licenses. John grew up in Evangelical churches and served as a teacher and deacon. In 1996, there was an event at his church that took place against John and his wife, which has scarred them greatly and started him on his long journey for truth. He still believes in God and sees Jesus as his Lord and Savior, but feels that much that has taught in the evangelical church (legalism, condemnation, etc.) needed to be questioned. Today, he and his family (Connie and Jordan) still attend a church, but are still seeking the place where God wants them. Both Connie and John have served with Mercy Ships (www.mercyships.org). Connie has been with them in Africa eight times (Liberia, Benin, Togo, Ghana, and others) and John once (2007 in Ghana). His daughter, Michelle was also there for an extended period (2.5 years) after receiving her undergraduate degree. The motto of Mercy Ships is “Bringing Hope and Healing to the World’s Poor.” That is, they are a Christian organization, but they believe this means reaching out to those in need with medical assistance. It is a very awesome ministry and those who volunteer to live in community onboard the ship as they serve countries in West Africa. Besides his four children, John considers this to be one of his more important contributions in his lifetime. John also has a heart, using his privileged position in life, to speak up for those who have been oppressed in this country and for those dealing with life-debilitating diseases (as does he). If you want to know more about that, just follow him on Facebook. Note: Guests create their own bio description for each episode. The Curiosity Hour Podcast is hosted and produced by Dan Sterenchuk and Tommy Estlund. Please visit our website for more information: thecuriosityhourpodcast.com Please visit this page for information where you can listen to our podcast: thecuriosityhourpodcast.com/listen/ If you would like to share your story or have a suggested guest, please complete the "Contact us" form: thecuriosityhourpodcast.com/contact-us/ Disclaimers: The Curiosity Hour Podcast may contain content not suitable for all audiences. Listener discretion advised. The views and opinions expressed by the guests on this podcast are solely those of the guest(s). These views and opinions do not necessarily represent those of The Curiosity Hour Podcast. This podcast may contain explicit language.